New Feature: Signup as a Regatta Volunteer in the Events Listing. SRA hosts the Mid-Atlantic Rowing Conference Championships at Lake Pinchot, Saturday, April 27, 2019. 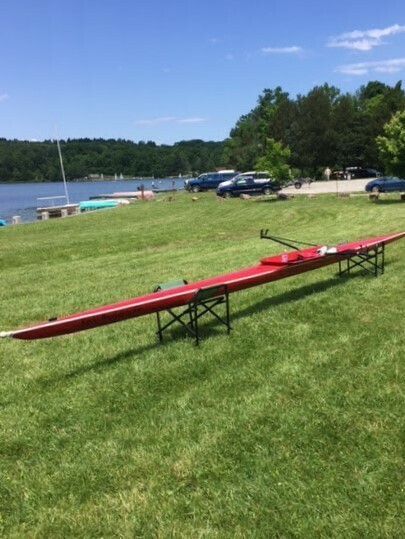 Susquehanna Rowing Association (SRA) will welcome the 11th Annual Mid-Atlantic Rowing Conference (MARC) Championships to Lake Pinchot on Saturday, April 27, 2019. This Regatta features Division III MARC and non-member crews competing in women’s and men’s pairs, and novice and varsity 4’s and 8’s events. MARC is the largest conference in Division III women's rowing and includes Men’s crews from seven member colleges. The day-long event is held at Pinchot Lake in Gifford Pinchot State Park. SRA is a non-profit group formed for the purpose of stimulating and fostering national and international competition by supporting and developing amateur athletes and by promoting interest in the sport of rowing. In the left panel below, open the event(s) to volunteer. Click on "Volunteer!". Besides the competing crews, volunteers are a big part of the event. Volunteers setup and run the event. They prepare the course: collecting watercraft like stakeholder boats; installing course lanes; and marking the beach launch site. On the day of the race additional duties include manning starter platforms; selling T shirts; driving boats; assisting race officials at the start and finish lines; and tearing down the course afterwards. SRA welcomes volunteers from the club and community, especially local high school students or community college students who are curious about any of the participating MARC colleges. It’s a great opportunity to meet enthusiastic undergraduates. High school students can apply volunteer hours to their community service requirement. After you volunteer, the SRA Regatta Coordinator, Tarin Summy, will assign you to a specific task based on your availability. Contact Tarin if you have time limitations; for example, if you can’t commit to a full day but want to volunteer for a morning or afternoon time slot. Susquehanna Rowing Association will be hosting Learn to Row Day. The event is held at Gifford Pinchot State Park in Lewisberry, PA and is sponsored by US Rowing and Concept2. Competitve and recreational rowers are welcome: 9 AM - 1 PM. Use the website CONTACT US if questions. See the FAQ "Boats" for recommendations what to wear. SRA stores 15 boats at Lake Pinchot including singles, doubles, quads for sculling and a sweep boat. Brands include Vespoli, Peinert and others.